Welcome to cityoftucson.org, unofficial page dedicated to the City of Tucson where you can find many useful information about the city and what is happening there. The City of Tucson is a city and a county seat of Pima Country in Arizona in The USA and it has approx. 530.000 citizens living there. Behind Phoenix, it is the second most populated city in Arizona. Tucson has always been a crossroads, meaning there is a great number of people passing through the city every day. Even though Tucson is geographically situated in the middle of a desert, the water was very plentiful there until recently. Throughout history, Tucson has become an important travel route and crossroad, an agricultural town center and a communication nexus. Archaeologists have recently unearthed an ancient village site in the Santa Cruz River valley dating back from 2100 BC. That is some of the earliest evidence of civilization in the city area. Today Tucson is the 33rd largest city in the US, quite modern and well developed. Due to its geographical position, Tucson has a desert climate which means that summers are very hot and dry. Apart from the citizens living in Tucson throughout the entire year, in the last decade there is a significant rise in the number of “snowbirds” – people who purchase second homes in Tucson to spend their winters there because of the mild climate during the colder part of the year. The city’s scene is very rich, both culturally and artistically, so everyone can find something for themselves in the city at all times. Tucson is a tech-savvy city, it actually has a first police department in Arizona to fully integrate drones into its line-up. Drones are capable of tracking, monitoring and providing pilot notification of what the drone sensors “see”. Our proud boys in blue have been using these high tech gadgets to track down missing people, for reconnaissance and to help the fire department track down hot spots (using thermal sensors). But enough about that, let’s talk about the city that we love and what our goals are with this website. This website is built by a small group of people who live and breath Tuscon and who would like to do their part in order to make this city be heard off around the world. My name is Christian Snyder and I’m the main driving force behind the team that runs this website as of late. Many different people are a part of the City of Tuscon team. Andrew, our resident aerial photography expert has captured a great video showcasing the very essence of the city of Tuscon. Paul uses high quality video drones to record videos like the one featured above. These videos really are a great way how to capture natural beauty of Tuscon, our city, and the surrounding scenery. With this website we hope to offer a place for Tucsonans to keep up with the latest news and happenings from around our city. We’ll post important updates to the public from the mayors office, police, fire department, and all the other public institiutions. Also, we’ll post updates about popular events, like arts shows, musuem tours, music concerts, sports, debates, anything and everything basically, so stay tuned. We’re sure that if you’re a Tucsonian you’ll be setting up this website as your homepage before you know it. City that we know today as Tuscon owes its beginnings to Spanish soldiers who in 1775 founded the Presidio San Augustin del Tuscon. Presidio is a type of fort used by the Spanish forces who at the time held the region under control. Before that Tuscon was a “pueblo”, a village. Even before being a village, area alongside the Santa Cruz river that was to become city of Tuscon, was visited by Europeans. In 1692 there was a Jesuit missionary named Eusebio Kino who visited the native American tribe at Stjukshon (or Chuk Shon). That is actually from where the name Tuscon came about. Since the year 1775 the city has changed hands many times. It actually flew 4 flags at one point, Spanish, Mexican, Confederate and U.S. After the wars for Mexican independence, Tuscon ended up being sold to the US (alongside other territory) in the Gadsden Purchase of 1854. 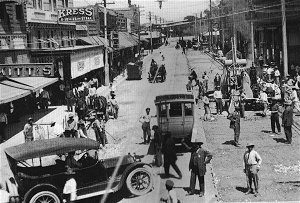 City served as the capital of Arizona from 1867 till 1877. Two things helped further develop Tuscon into the brimming city that it is today. First it was the arrival of the Southern Pacific Railroad in 1880, and then discovery of silver and copper in nearby Toombstone and Bisbee, respectively. After the World War II the city has experienced an additional rapid development which was fueled by the annexation of suburbs. Today the city has a little over 520 thousand inhabitants and over 1 million people lives in the larger metro area. Tuscon is located along the Santa Cruz river, about 115 miles southeast of the state capitol Phoenix. It is the seat of Pima county which as a whole has a population just above 1 million people. At the north the city is bordered with Santa Catalina and Tortolita mountains. At the south people of Tuscon can enjoy in the Santa Rita mountain. East and west are bordered by Rincon and Tuscon mountains, respectively. City of Tuscon is located on the alluvial plain of the Sonoran desert. 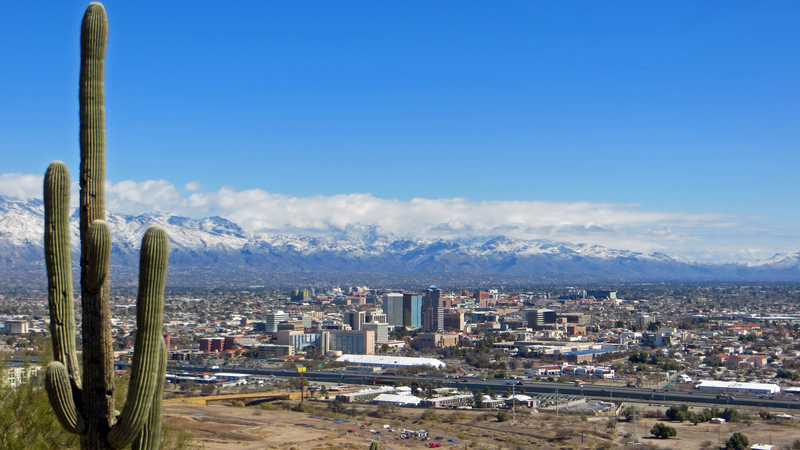 Elevation of around 2,600 feet above sea level gives Tuscon different weather patterns when compared with Phoenix. Higher elevation means that Tuscon has combination of cooler and wetter weather than the one found in Phoenix. Another useful aspect of having such a high elevation is that mountain ranges that surround Tuscon get a snow cover during winter. Most famous for this are Mount Lemmon and Mount Wrightson, former of which actually has the southernmost ski resort in the continental United States called Ski Valley. Climate is probably the thing that Tucson and Arizona in general are most famous for. Entire city resides in the plain of the famous Sonoran desert. Summers are hot and dry and winters temperate with temperatures that rarely dip below freezing. Over the past couple of years we’ve started seeing more and more people from other parts of the country purchasing winter homes in and around Tuscon to get away from harsh winters in their own home states. These are the so called “snowbirds” that we’ve already mentioned. 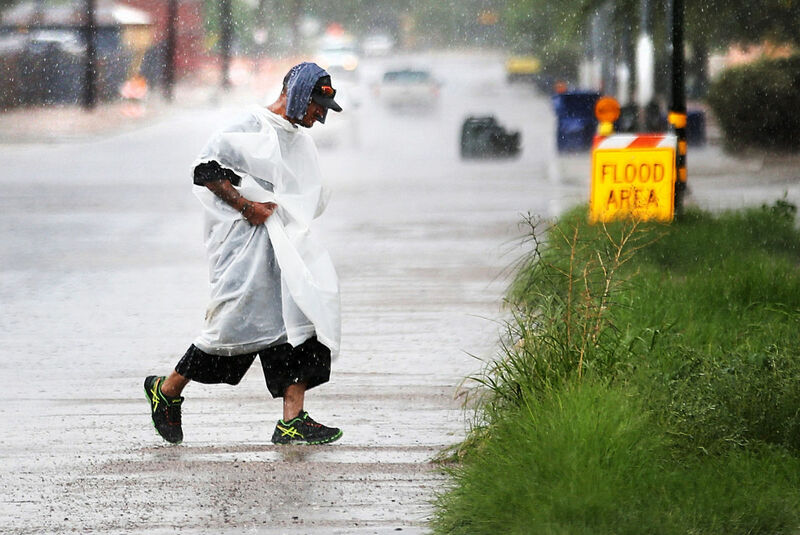 End of summer in Tuscon, mid-June to August, September at the latest, is characterized by the North American monsoon. During this time daily thunderstorms are a common occurrence, which drop considerably amounts of rain that can cause flash floods. As the monsoon subsides the regular dry weather with cool nights and warm days comes back signifying the start of fall. Temperatures at spring and fall are similar, around 90°F. During summer they go up and during winter down, with about 10-15 degrees difference between the two. 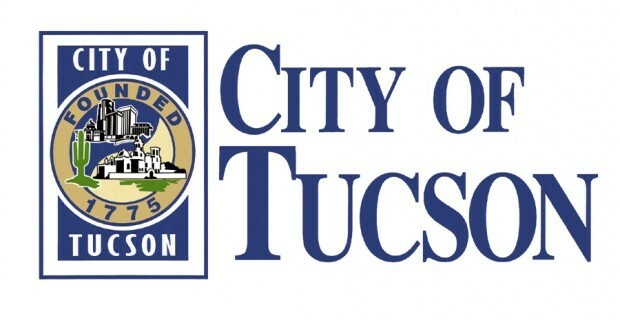 City of Tucson has about 233 elementary schools and 158 high schools of various degrees of excellence. Tuscon is the seat of the University of Arizona. Each year tens of thousands of students are enrolled and promoted from the largest and most well known higher learning institution in the state. 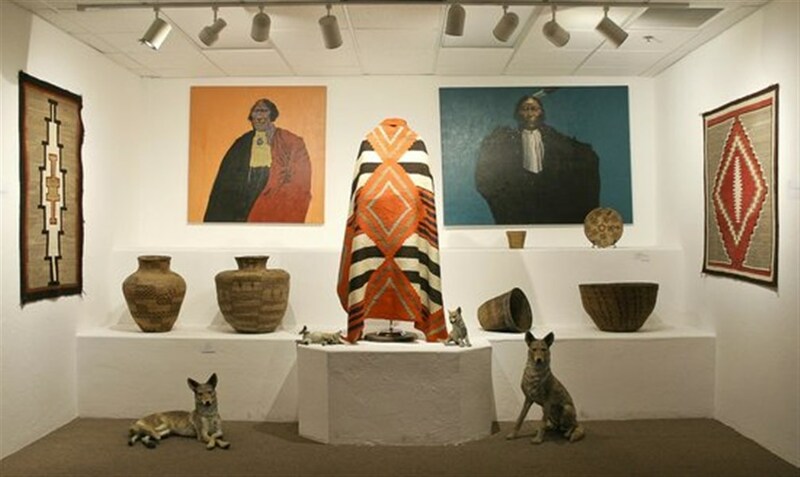 As far as galleries and museums goes, Tuscon has dozens of top national galleries and museums where people can view and enjoy art and cultural heritage of the native peoples. Perhaps the most famous are the Arizona-Sonora Desert Museum and Arizona State Museum where exhibits can be found ranging from archeology (minerals) to specimens of indigenous animals to artifacts of the native American tribe Stjukshon. Community is the main idea behind this project of ours and it would mean the world to us if you get in touch with us and offers us a helping hand with one of the many different area that we cover. Do you perhaps have the drop on a new cool music event in town? A concert that we should cover? How about a signing of a cool new book? Help us out and report on all the cool events that we might have missed. We’re only humans and there’s just 4 of us on the team so far, so we need all the help we can get. Read more about us on the about page and visit the contact page to get in touch with us.